Amazon.com Price: $240.99 (as of 2019-04-19 02:37:35 GMT) Product prices and availability are accurate as of the date/time indicated and are subject to change. Any price and availability information displayed on Amazon.com at the time of purchase will apply to the purchase of this product. Featuring Britax’s head safety technologies and True Side Impact Protection, the Boulevard Convertible Car Seat is designed to provide advanced protection for your child during a crash. 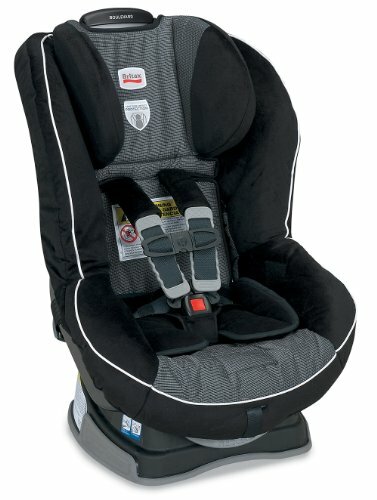 It’s packed with safety features including integrated steel bars and a tangle-free, five-point harness while also offering easy to use features like a quick-adjust five-point harness, an EZ-Buckle system, and an easy-remove cover with access to the belt paths from the front of the seat for convenience when installing the seat and securing your child. The Boulevard accommodates children rear facing from 5 to 40 pounds and forward facing from 20 to 65 pounds. During a car crash, impacts with the front seat aren’t just dangerous – they can be deadly. 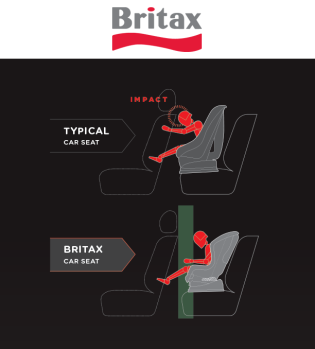 BRITAX convertible car seats lower your child’s center of gravity to keep them safe, secure and away from front seat. The base of the Boulevard includes SafeCell Technology comprised of SafeCells, an engineered material designed to compress in a crash. This compression lowers the center of gravity to counteract forward rotation of the seat, helping to minimize the risk of head injury during a collision. Located in the sides of the seat shell, integrated steel bars strengthen the connection to the vehicle and prevent forward flexing of the seat during a crash to reduce the risk of head injury. Hugs Chest Pads with SafeCell Technology ensure proper positioning of the chest clip while SafeCells compress to manage energy and provide resistance to the forward movement of your child in a crash. In the event of a sudden stop, the Energy-Absorbing Versa-Tether strap restricts forward movement and reduces crash forces with patented staged-release webbing and two-point attachment. This webbing securely anchors the top of your child seat to your vehicle in either rear- or forward-facing positions. The tangle-free, five-point harness allows for multiple height positions and can be adjusted without dismantling the harness or removing the car seat from the vehicle. Two buckle positions provide a snug, comfortable fit as your child grows. The seat’s harness holders prevent the straps from getting in the way when you’re putting your child in the seat, while the EZ-Buckle system maintains the harness buckle in a forward position to prevent your child from sitting on it when first entering the seat. Rear- and forward-facing recline options, as well as high-density foam cushioning, help your child relax on the journey. And the plush cover comes with matching comfort pads and an infant positioning pillow to keep children of all ages comfortable and secure.Product Information: The Britax Boulevard is assembled in the USA and has a seven-year life.What’s in the Box: Boulevard Convertible Car Seat, removable cover, comfort pads, infant positioning pillow, and user guide. The Britax True Side Impact Protection system guards your child’s head and limits injury by shielding from vehicle intrusion and absorbing crash energy. The car seat has deep side walls lined with energy-absorbing EPP foam. This combination diverts crash force energy away from your child while creating a barrier against possible intruding objects. The head restraint offers a double layer of energy-absorbing foam and keeps your child’s neck and spine properly aligned in the seat. The Boulevard takes the guesswork out of installing your car seat thanks to a range of convenience features. An anti-slip, contoured base grips and protects the vehicle seat. Premium lower Latch connectors make for a quick, simple, and tight installation, while the push-button allows you to easily uninstall the car seat. And easy-to-access built-in lock-offs provide a secure installation when using the vehicle lap and shoulder belt.